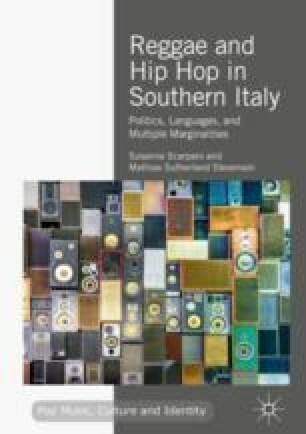 This chapter discusses the legacy of the posses and the influence of pioneering Apulian and Sardinian groups, such as Different Stylee, Sud Sound System, and Sa Razza, on independent Sardinian artists Randagiu Sardu and Claudia Aru, as well as on the Apulian Mama Marjas, known as the “Queen of Italian Reggae.” The chapter argues that such a legacy is mostly evident in the younger artists’ view of music as message, and thus of themselves as self-produced and independent musicians, not interested in using music to achieve fame but committed to raising consciousness to affect change. Conti, Eugenia. 2015. Mama Marjas, la guerriera che canta le battaglie di Taranto. Identita insorgenti, May 6. http://www.identitainsorgenti.com. Accessed 13 Sep 2017. Fanelli, Antonio. 2015. Il canto sociale dai Dischi del sole alle posse. http://www.treccani.it/enciclopedia/il-canto-sociale-dai-dischi-del-sole-alle-posse_%28L%27Italia-e-le-sue-Regioni%29/. Accessed 12 Sep 2017. Ilva, I dati su malattie e inquinamento ‘Taranto non supera Roma.’ 2016. La Gazzetta del Mezzogiorno, December 7. http://www.lagazzettadelmezzogiorno.it/news/home/834791/ilva-i-dati-su-malattie-e-inquinamento-taranto-non-supera-roma.html. Accessed 10 Mar 2018. Kemp, Danny. 2016. EU Opens Probe into Italian Aid for Polluting Ilva Steelworks. Phys.org, January 20. https://phys.org/news/2016-01-eu-probe-italian-aid-polluting.html. Accessed 10 Mar 2018. Kington, Tom. 2012. Italian Town Fighting for Its Life Over Polluting Ilva Steelworks. The Guardian, August 17. https://www.theguardian.com/world/2012/aug/17/italy-ilva-steelworks-cancer-pollution. Accessed 20 Sep 2017. Mama Marjas. 2014. Intervista con Mama Marjas—Reggae. Today. YouTube, October 20: 10. https://youtu.be/mTSwuQAeyeQ. Accessed 10 Mar 2018. Randagiu Sardu. 2011. Fibai e Tessi | Randagiu Sardu | nootempo NOOT006—Official Single Sardegna. YouTube, July 13. https://youtu.be/5I7dsumikt0. Accessed 10 Mar 2018. Signorile, Nicola. 2012. Quando il reggae e femmina. Parlano Mam Marjas e Miss Mykela. Corriere Del Mezzogiorno, June 12. http://corrieredelmezzogiorno.corriere.it/napoli/notizie/spettacoli/2012/12-giugno-2012/quando-reggae-femminaparlano-mama-marjas-miss-mykela-201569189504.shtml. Accessed 15 Sep 2017.